I can't believe after all that build up Christmas has come and gone. Wow! Despite the craziness it was well worth it and quite enjoyable. We had a very quiet day at home, a lazy morning and a lunch that was so late it became dinner. 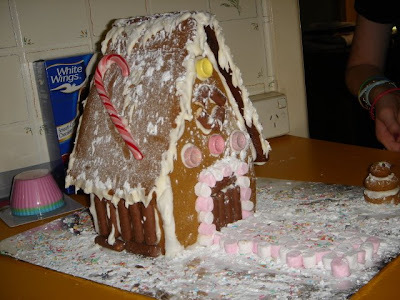 My girls got together and made a gingerbread house on the 23rd of December. 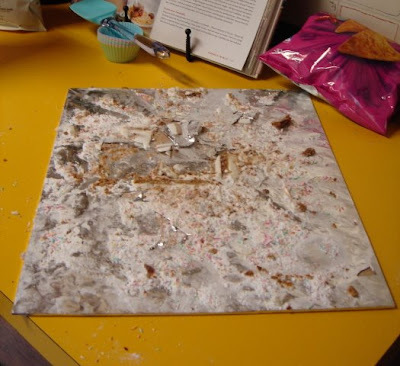 For a first try it turned out pretty good and they definitely enjoyed decorating it. Here it is in all its glory. I think as many lollies were consumed in the making, as were applied to the house, but i guess that's also part of the fun. 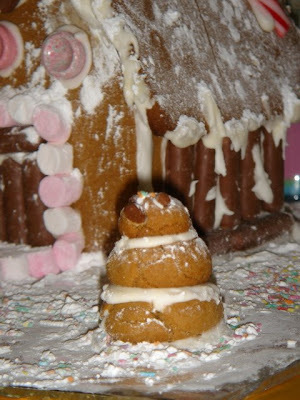 Liv made a special gingerbread snowman just the right size. He was the first casualty on Christmas day. But alas, now there is none. I was thoroughly spoilt on Christmas day by my SSCS partner Sherri. 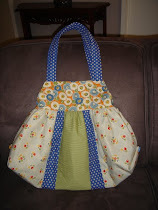 Sherri gave my 3 gorgeous handmade gifts, a tablerunner, a basket and a little zippered bag. 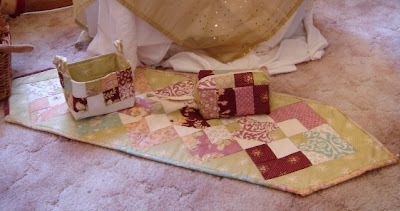 All beautifully made in very pretty fabric. 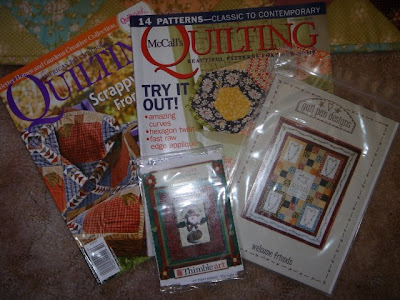 As well as these lovely gifts, Sherri also sent me 2 American quilting magazines and 2 patterns. Thank you Sherri for your beautiful gifts and thank you Donna for organising this great swap, it really made my Christmas day. There's HOW many days 'til Christmas ?!!! Wow ! It's hard to believe Christmas is just around the corner. Maybe i should start thinking about what i can get my kids, there's nothing like last minute pressure to make a girl completely freak out. It was also a big surprise to see how long it had been since my last post. These things can't be helped when your laptop decides enoughs enough and packs it in. It was only through my DHs expert part replacement that we are back up and running again. Being without my laptop is almost as bad as being sewing machineless ( which won't / can't happen - i have quite a few back ups ). 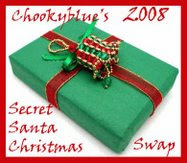 Anyway now i can show what a wonderful blogger sent me in Chookyblues SSCS. 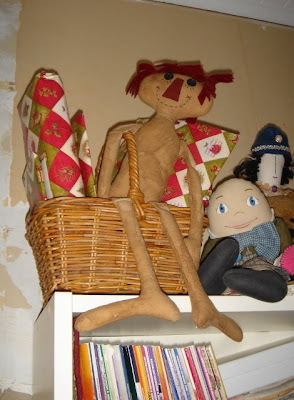 My rather naked Button Annie is doing a great job minding the presents until Christmas. However they did get a fondle and squeeze before being removed to a safe height. A big thanks to Chookyblue for organising this swap and a huge thanks too to my secret santa. Hi, I'm a 41yr old mum to 4 usually adorable kids. I love to create and hope i can share some pictures of what i have been up to..... i just have to learn to finish what i start !